The Lillian on the left is what I gave to the daycare teachers 15 months ago. She was brand new and we hardly even knew her yet. Lilly’s teachers were essentially the same crew that Gabby had and I knew I could trust them with her, but it’s just heartbreaking to spend time away from a baby so new. She wasn’t sitting supported yet, she was still exclusively breastfed (but started bottle-feeding just prior to starting daycare). I don’t even think she received her second round of shots yet. The Lillian on the right is what I have now. She is starting to use two word sentences, is the queen of “MINE,” she dances, and she demands specific songs from me at bedtime. Even though I took the time with Lilly to see her during my work day for close to the first 9 months I still feel like I missed so much. She has matured so much faster than Gabby did. 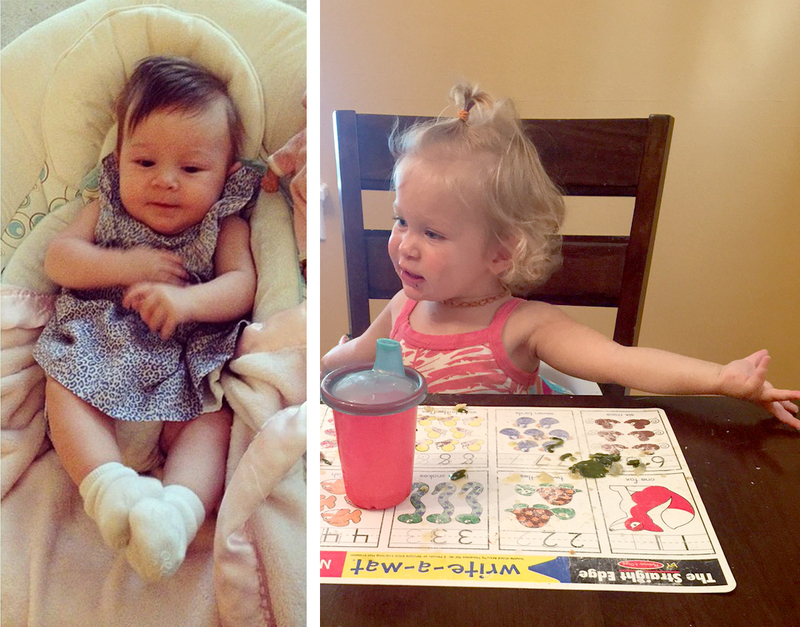 She crawled sooner, talked sooner, tried table food sooner… We’ve been trying to hold her off from potty training for weeks because she is transitioning to the toddler classroom and I don’t want her to have too many changes happening at once. With Lilly being our last baby, every milestone is a reminder that it’s the last first steps or the last first cheerios. It’s simultaneously so sad and so freeing to think that we are soon going to be parents of pre-schoolers – not babies. It’s the end of an era and the start of a new one.